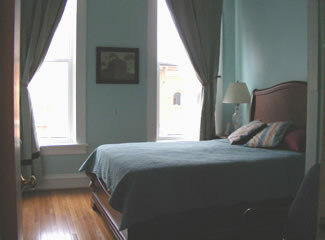 Market Street Walk-up offers a spacious two bedroom apartment in the heart of historic downtown Mount Carroll. We are located above New Morning Glass at 113 W. Market St. We have one queen bedroom, one full bedroom, fold out couch and a roll away twin. Plenty of room for two couples or the whole family. 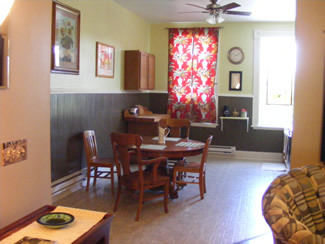 The apartment has large kitchen equipped with everything to make a meal and a big oak round table to enjoy it at. 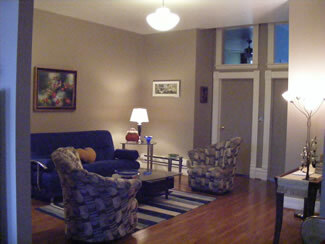 Also washer/dryer in apt., hardwood floors, high ceilings and air -conditioned. Life is good! Enjoy a weekend in our clean, home away from home, Mount Carroll getaway!